The State Department found a diplomatic solution to purchasing commercial products and technology without alienating vendors or paying top dollar. Foggy Bottom procurement officials now use FedBid’s reverse auction technology to negotiate the lowest price for everything from light bulbs to laser printers. In a reverse auction, sellers try to meet the specific needs of a purchaser by underbidding their competitors within an allotted time period. 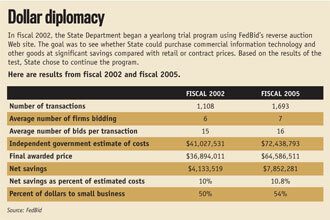 Registered agency procurement officials list their needs on FedBid’s Web site and vendors bid down the price. In the end, the lowest bidder gets the sale. In 2002, FedBid officials met with John Stever, division director for information technology contracts at State, and his boss, Cathy Read, the department’s director of acquisitions management. They agreed to a yearlong FedBid trial program to purchase products for the department and its embassies and consulates worldwide. “Initially, it was [to buy] computer products, monitors, commodity products from the major manufacturers,” said Douglas Stuck, director for civilian agencies at FedBid. State conducted more than 1,100 reverse auctions in the trial program worth about $39 million, for a net savings of $4.1 million, Stuck said. Since then, State has completed 4,700 reverse auctions worth $169 million, for a savings of $17.6 million from its original expected expenditure of $186.7 million, Stuck said. Stever said State’s average savings from 2002 to 2005 have been 6 percent to 10 percent of estimated costs. “I’m a very strong proponent of reverse auctions,” he added. In one overseas procurement, State used the reverse auction to solicit bids for Cisco Systems and Hewlett-Packard computers from resellers registered with the General Services Administration, said Geoffrey Miller, FedBid’s chief operating officer. State allocated $50,250 for the purchase. Six resellers bid to make the sale, which ended up costing State $45,375 — a savings of $4,875. “When IBM and Dell can get in the ring and knock each other around, that’s good for the [purchasing] agency and that’s good for FedBid in that we can really deliver some substantial savings,” Stuck said. Federal agencies are increasingly challenged to be creative in their procurement methods, he said. Reverse auctions streamline the administrative burden and costs of collecting competing quotes, in addition to the bottom-line savings. “It’s all about time — saving vendors’ time to sell and purchasers’ time to buy,” Miller said. se auctions are not popular with everyone. Christopher Yukins, associate professor of government contract law at George Washington University School of Law, said reverse auctions can be abused because they are not federally regulated. “The working assumption is that reverse auctions are used primarily for small commodity items and therefore the overall risk to the government isn’t significant,” he said. There is nothing to keep someone from using reverse auctions for large purchases, however, and that could lead to problems with costs and quality, he added. Click here to enlarge chart (.pdf).